Mirela Iverac is a reporter for WNYC, where she covers poverty and homelessness. She joined the station in 2011. In 2016, Mirela was a finalist for the Livingston Award for Young Journalists. She previously won a Gracie award for Outstanding Reporter and Best New Journalist in the New York metropolitan area award from the Newswomen’s Club of New York. Her work has also been honored with other awards from the New York Press Club, the Garden State Journalist Association, and the Newswomen's Club of New York. 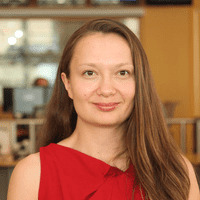 Prior to joining WNYC, Mirela spent a year at the New York Times’ metro desk as a freelance contributor. She also reported for Time Magazine, the New York Daily News and Forbes, among other publications. Mirela holds master's degrees in journalism from Columbia University and in international affairs from the University of Cambridge, U.K.
NYCHA says it will test 135,000 public housing apartments to determine exactly how many have lead paint. A look at the ongoing homelessness crisis, what the city is doing and why nothing seems to be working. As part of its strategy to tackle homelessness, the de Blasio administration has paid 2,300 New Yorkers to move out of the city. A new report suggests that New York City may have to spend even more money than previously thought to fix its public housing. At a victory rally, community advocates laid out a message for other companies considering a move to Queens and called for broader solutions to economic development issues. Housing authority staff reportedly spiffed up the first destination where the HUD regional administrator, Lynne Patton, will stay. She'll spend a week with each of four families and feed information to the yet-to-be-appointed independent monitor. Baraka says moving the homeless into substandard apartments in Newark does nothing to break cycle of homelessness. The de Blasio administration and the federal government need to reach an agreement by the end of Thursday on how to fix the city's crumbling public housing system. As a driver for Lyft and Uber 43-year-old Percy Henderson navigates the city's congested streets nearly every day. Two former Throggs Neck managers allegedly threatened their subordinates, organized drunken parties during work hours, and engaged in sexual relationships with staff members. The federal shutdown is causing confusion and concern among landlords and tenants who depend on rental assistance. Council Member Ritchie Torres says it's a ploy to keep out people who don't have credit cards or smart phone apps. The number of New Yorkers unable to buy enough food has significantly decreased over the past six years, according to a new report. When Amazon opens its new hub in NYC, its neighbor will be the largest housing project in the country whose residents have high expectations that the company might not deliver on. Mayor de Blasio announced an ambitious plan more than a year and a half ago to build more, better shelters, and to locate them more evenly throughout the city. A new contract gives suburban New York workers four hours of paid leave on Election Day to cast their ballots. More than 114,000 students in New York City schools were homeless at some point during the last school year. Young anti-gun violence activists marked one year since the deadliest mass shooting in U.S. history with a rally in New York City.